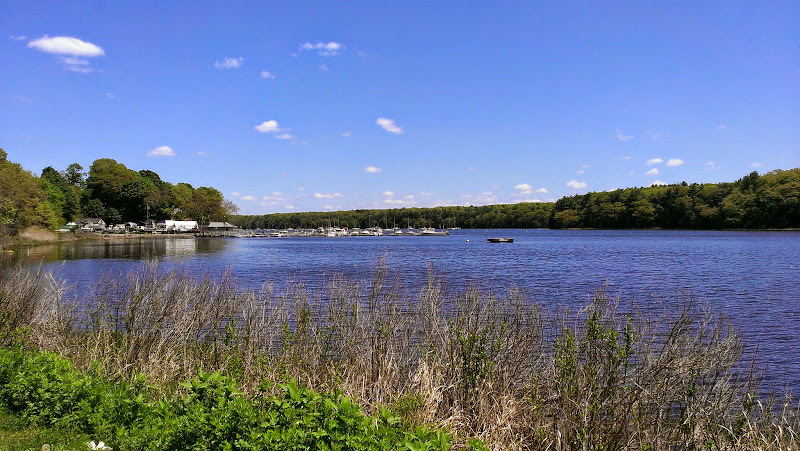 ← It’s Good To Be Back “Home”! Good to be back “home” but certainly no time to sit and relax! 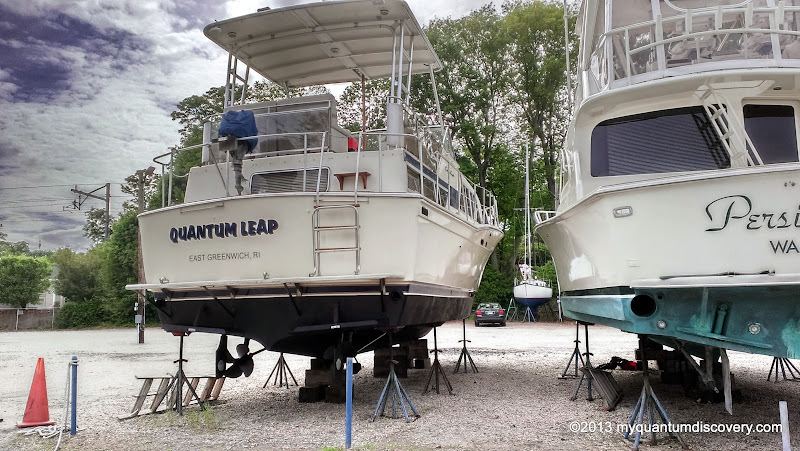 Quantum Leap was scheduled to be launched at the East Greenwich Yacht Club on Wednesday, May 21st, a mere five days away and the weather forecast didn’t sound great – lots of showers in the forecast. 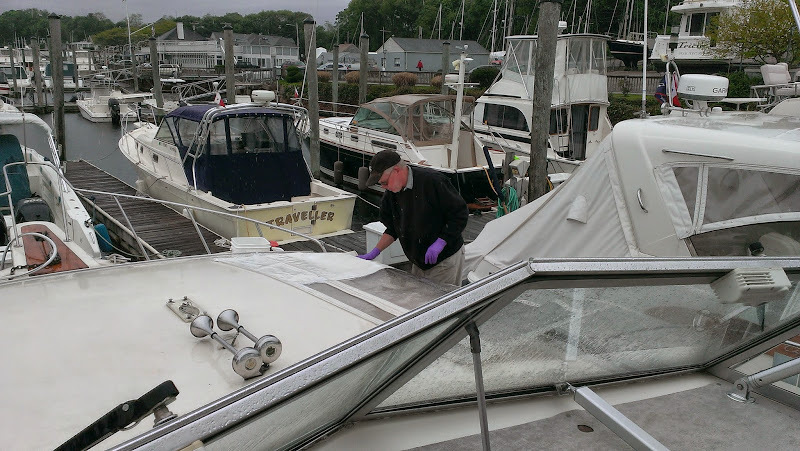 Oh, oh, not ideal for shrink wrap removal, waxing the hull and painting the bottom. But as luck would have it, each day the showers kept to the late afternoon or early evening so we were able to get all our work done without dodging rain drops. Being exhausted from our hour long drive down from Normandy Farms (LOL) on Friday 5/16, yours truly wasn’t in the mood to cook (am I ever in the mood to cook?) so that night we headed to one of our favorite local restaurants, Retrovo’s in East Greenwich for their most excellent fish & chips. Delicious! Ah, yes, it was good to be home! 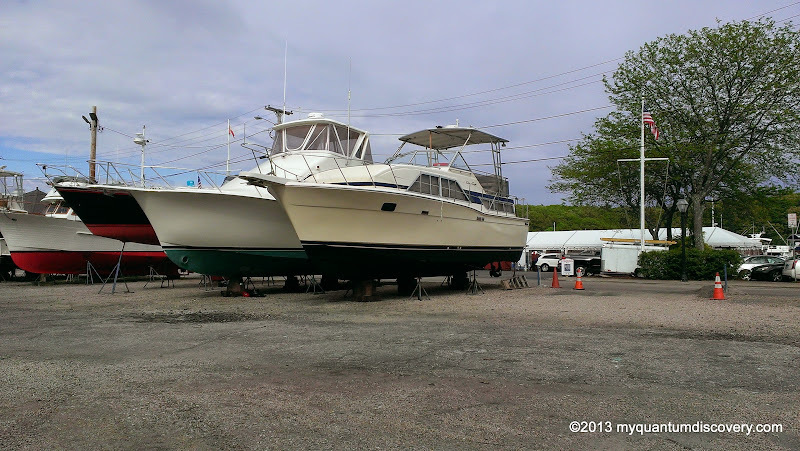 On Saturday, the first order of business was a trip to our storage unit to pick up bottom paint and other boat stuff. Of course on the way we had to make a stop at one of our favorite breakfast spots, The Olde Theater Diner in Coventry, RI where we enjoyed a yummy breakfast. 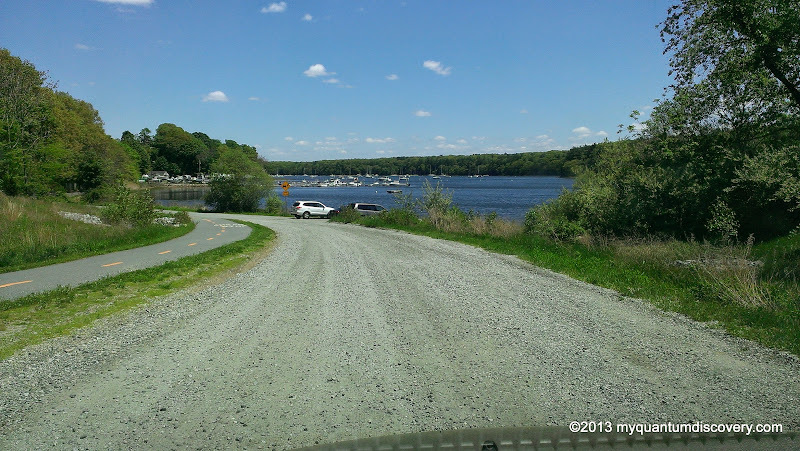 Then with the van bulging at the seams, we were off to a local marine hardware store (Salk’s) and a few other places to pick up some other supplies we would need for prepping the boat. Finally, we were done with our errands and it was time to get to work. 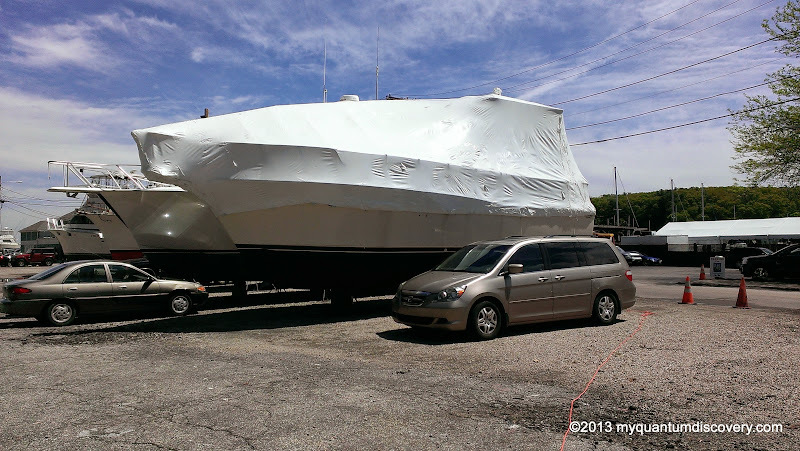 In all the years we’ve been boating, my least favorite job each year is removing the shrink wrap. Actually Rob removes it, cutting it off the boat and disassembling the wooden frame, then it’s my job to try to fold the monstrous sheets of plastic into recyclable sized chunks. Add a little breeze into the mix and it quickly becomes a two person job. But fortunately within a few hours that job was done. Over the next few days, waxing, waxing and more waxing was on the agenda. 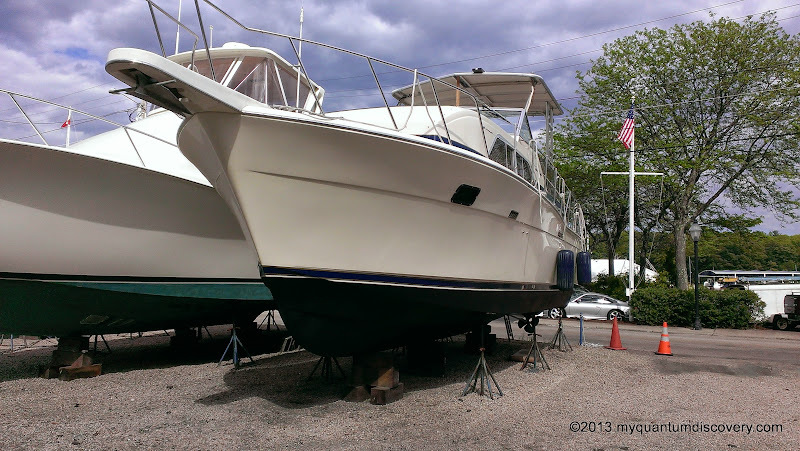 We typically use Collinite Fleetwax #885 as the final coat on the hull which we have found holds up to the sun and salt better than anything else we’ve tried and makes the spring cleanup much quicker. The only downside is the #885 isn’t a cleaner so we first need to use another product to get off any black streaks or scuffs. This year went faster than usual as Rob used the electric buffer to put on the cleaner wax and then helped me with the Collinite application – with the two of us going we had the waxing done in a little over a day. 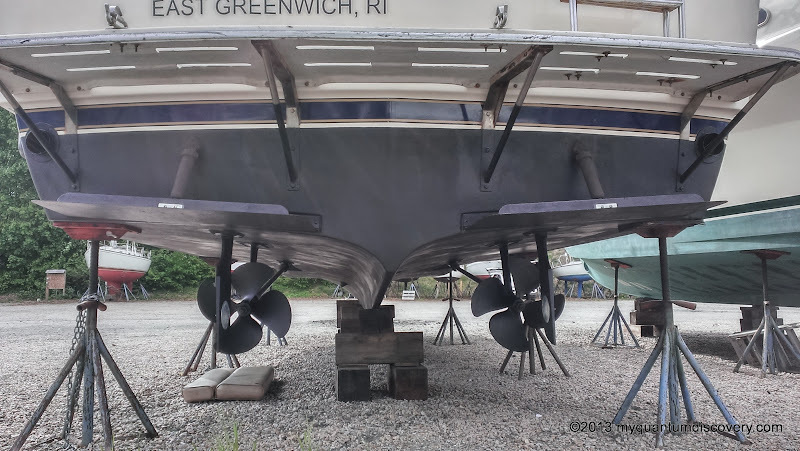 Once the waxing was done, it was time for Robbie to crawl underneath, not a pleasant task since he had to crawl around on sharp gravel to scrape the barnacle bases off the running gear (props and shafts), and touch up the bottom paint. The props, shafts and other underwater metal parts always attract more growth than the fiberglass hull bottom. The painted fiberglass parts of the bottom will have virtually no barnacles and just maybe a little dried up slime which wipes right off. The metal parts end the season with a fairly thick coating of barnacles, particularly if the boat didn’t move much (and it didn’t move at all last season)! 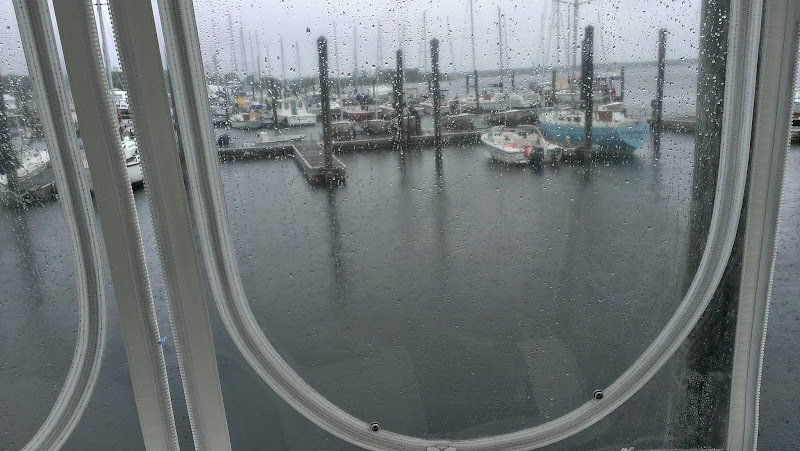 We hire a diver just before haul-out in the fall to scrape off the worst of the accumulation, then the yacht club power washes off the majority of the slime, but we are still left with the calcified barnacle bases that have to be scraped/sanded off the metal shafts and props. 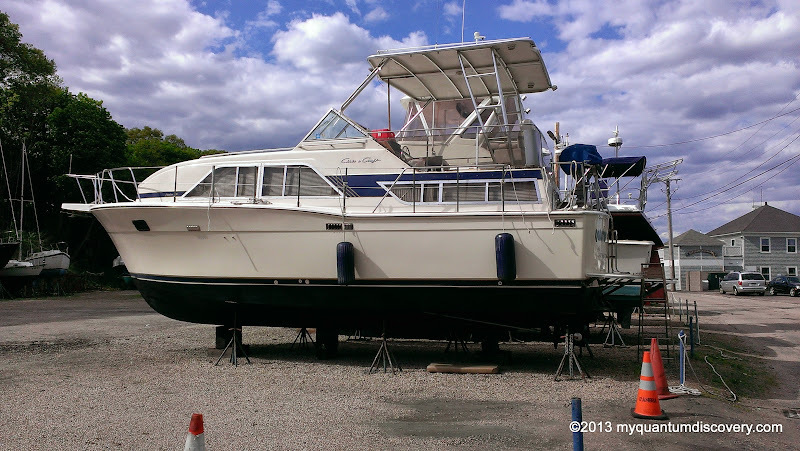 The antifouling bottom paint we use is an ablative multi-seasonal. 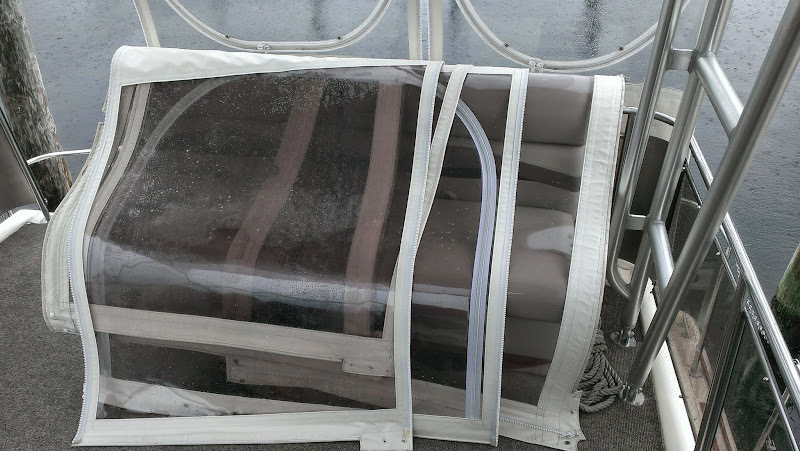 Ablative means the outer layer of paint wears away as the antifouling properties abate exposing new antifouling while leaving the bottom smooth. 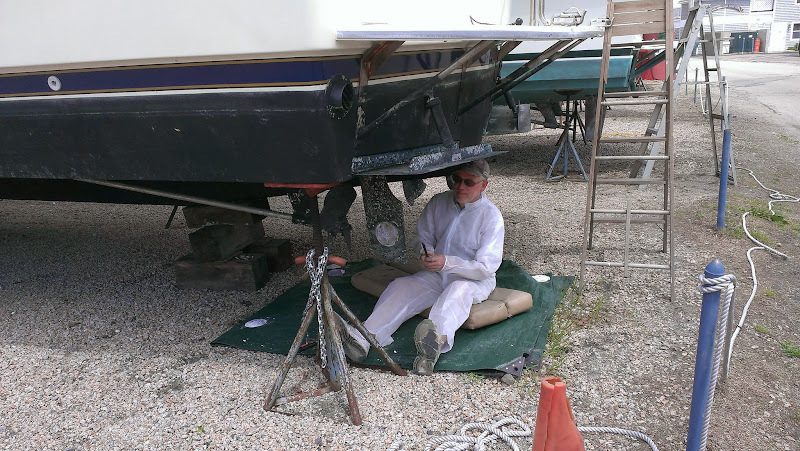 Multi-seasonal means the paint can survive repeated haul-outs and extended periods out of the water without losing its antifouling properties. This year once again we did not need to paint the entire bottom, only the high wear areas and any spots where my red tracer coat was showing thru the black outer coats. 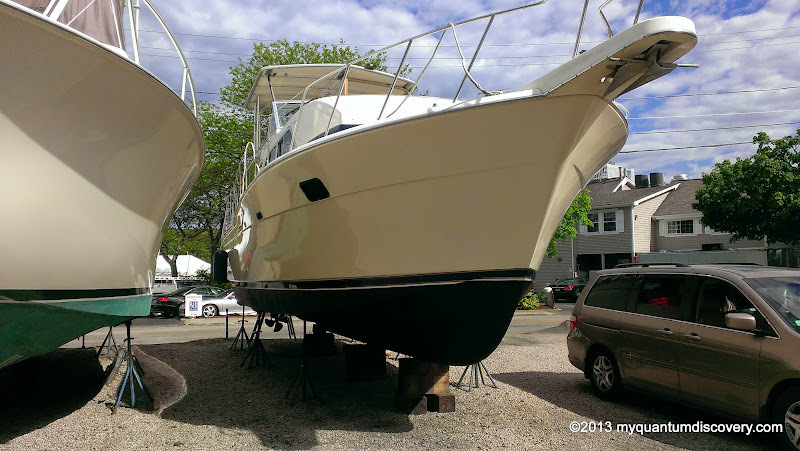 After the painting was all done we installed the zincs (sacrificial anodes). The zincs are made of – you guessed it, zinc – and sacrifice themselves to save the other expensive bronze and marine alloy metals from galvanic or stray current corrosion. 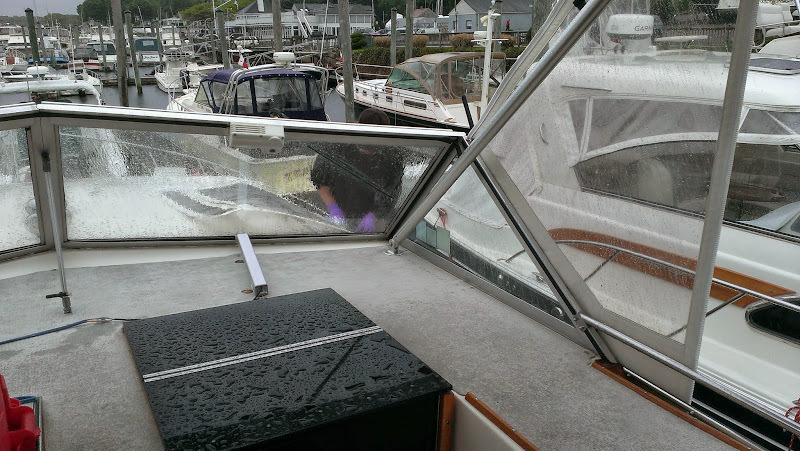 We install one zinc on each prop shaft, one on each rudder and one on each trim tab. Now that Rob has upgraded much of the wiring in the boat and re-done the bonding system we still have some zinc left at the end of the season so they are doing their job. Two or three times during the season we use a special probe to check for the health of the zincs – this is done while the boat is in the water and without the need for any scuba gear. 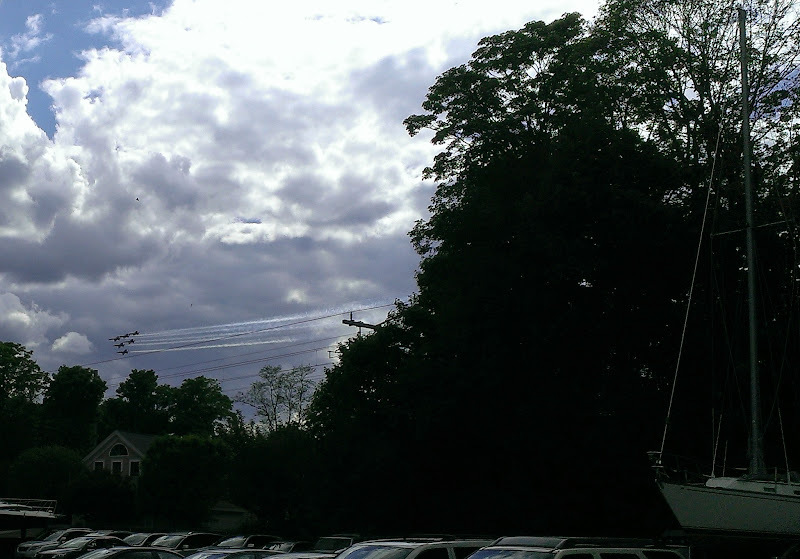 As a bonus, all weekend long we were entertained by the Blue Angels who were performing at the Quonset Air Show a few miles down the bay. Pretty neat but loud! 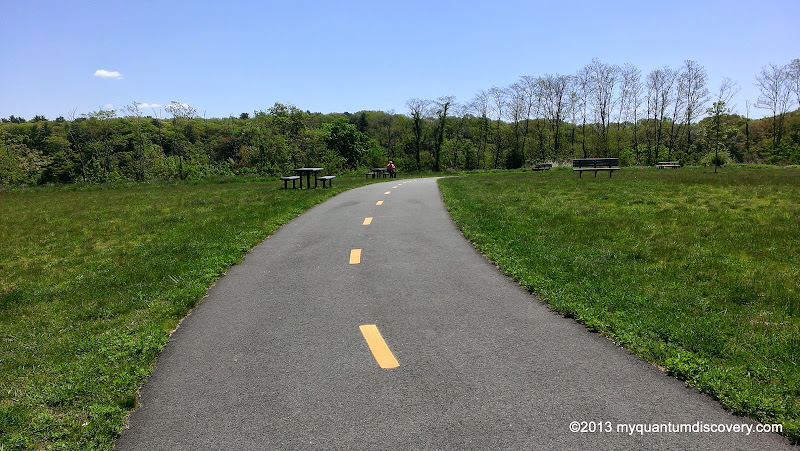 Finally Wednesday arrived – launch day was here. High tide that day was around 2pm so we were told by our club steward that RI Boat Movers would start launching boats around 11 am and that we would be one of the first. That would work out well since we wanted to scrub the cockpit so we could then put up our bridge enclosure. Being first would give us time to do that. Once we were sure everything was ready to go, we went up to Main Street in East Greenwich where there are several breakfast joints. We used to frequent a little place called Audra’s but that went out of business several years ago and was replaced by another restaurant but that was short lived as well. Seems to be what happens in this small town, restaurants come and go quite frequently. 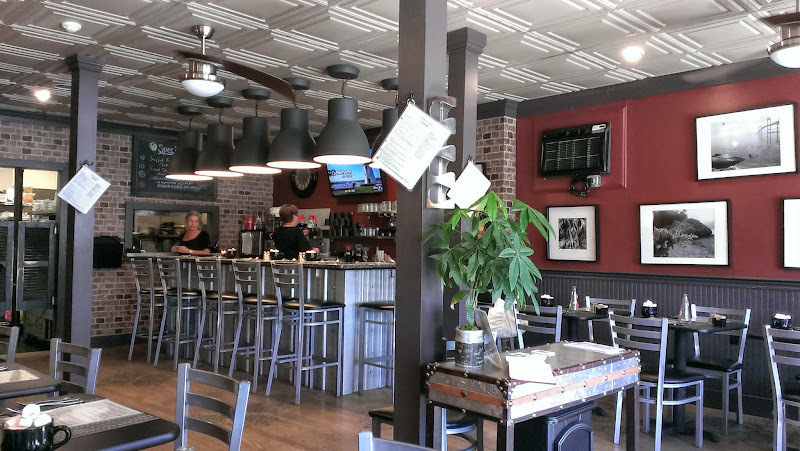 Dante’s Kitchen, dubbed as American Fare with Southern Flair is now where Audra’s used to be. Walking in we were shocked at the change – Audra’s used to be a typical small town restaurant, clean but sorely in need of an update. It had been totally renovated and was now very upscale, very bistro-like. Although it was a little pricey, it had some unusual things on the menu. Rob had the pulled pork hash and I had a beautifully presented bacon and eggs. Oh my, both dishes were soooo good! Definitely have to try it for dinner (BYOB). 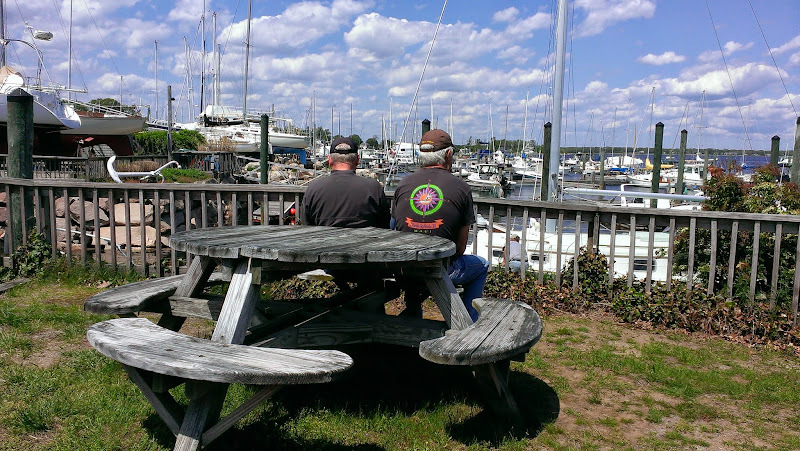 When we arrived back at the yacht club, the boat movers hadn’t arrived yet. It was a nice day and some of our friends were there so we didn’t mind hanging around. 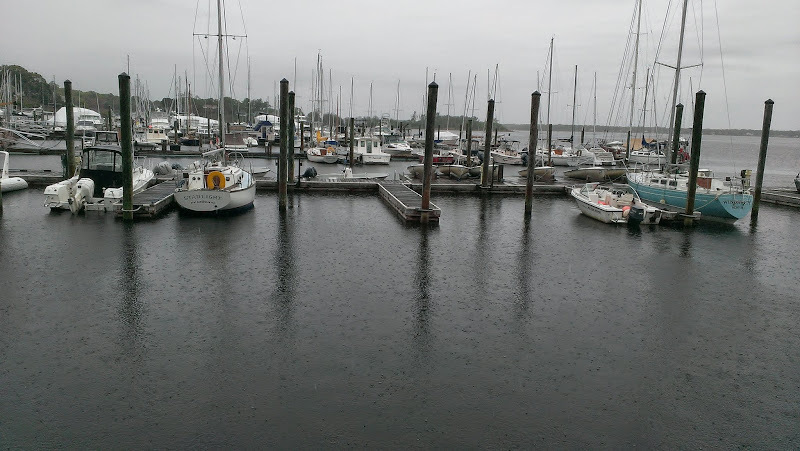 Good thing because the movers ended up arriving late and they needed to bump the sailboats up to the top of the launch list (the deep keel boats need the deepest water around high tide). So guess what, we were bumped from first to being number 14 (out of 14) on the list. I think we finally were splashed around 3 pm. Oh well, we were still able to give the cockpit a good scrub before the end of the day. Over the next few days, we spent time putting up the enclosure and getting her loaded up with all the necessities of life. Our land yacht is great but it sure felt good being on the water again! 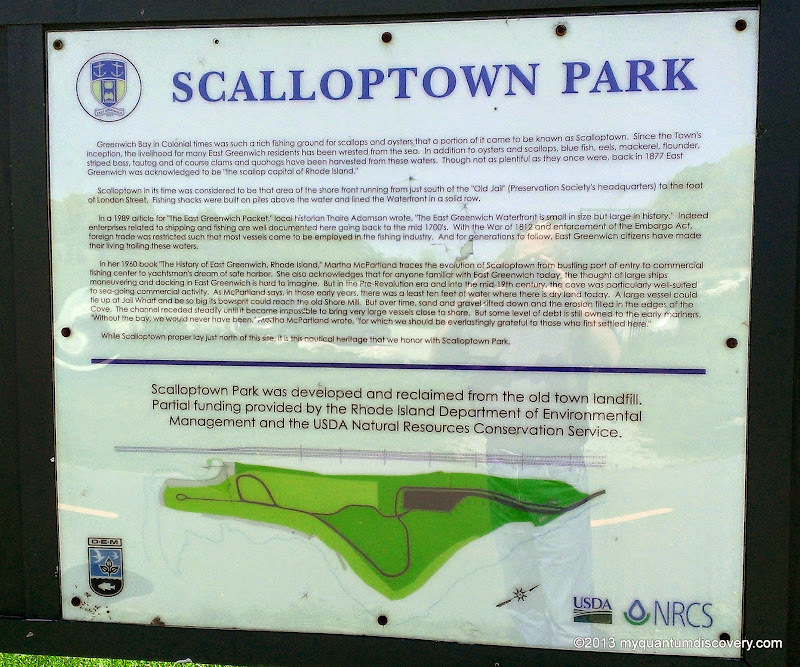 We also found a little time to find a geocache in Scalloptown Park! Have you ever tried Simoniz Royale? it is a great wax with some cleaner in it as well. 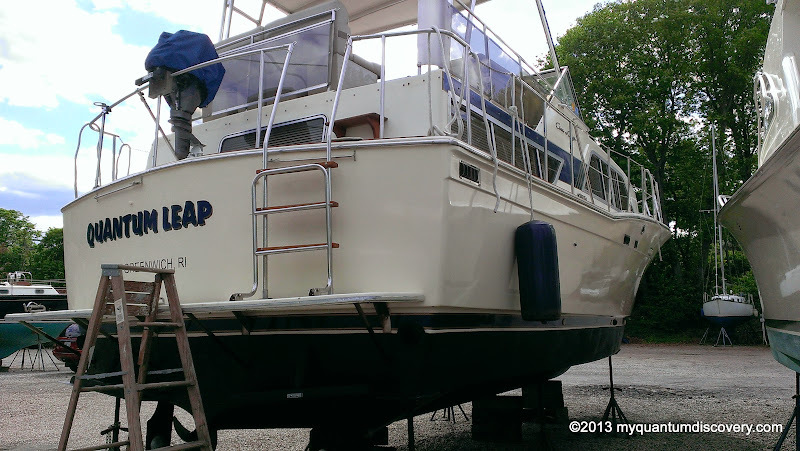 I have used it since I owned my first boat and it was recommended to me by an older salt that I!